This week’s Table Talk gives you a sneak peek of the brand-new KAIYŌ, a tip on where to find fab falafel in the Lower Haight, some awesome dumpling and double cheeseburger deals, and a feast for the senses of food, wine, and chamber music in beautiful locations at the Musica Marin Festival. Union Street just got quite the new looker (and taster! ): meet KAIYŌ, a unique concept that features a spin on Nikkei cuisine, a Japanese-inspired style of Peruvian cuisine. 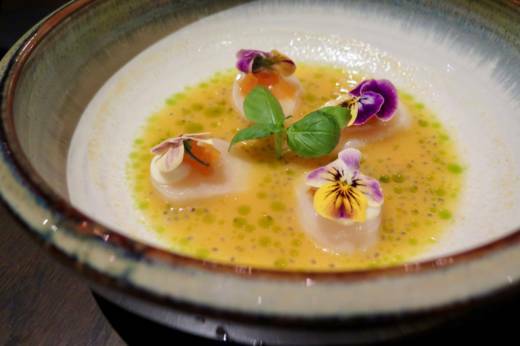 A perfect example of this culinary crossover is the Hokkaido scallop tiradito (served raw), with passionfruit leche de tigre, sweet potato purée, chia, and pickled red onion. The appealing menu includes crudos, a variety of sushi-style rolls, nigiri, and sashimi (with exquisitely sourced and prepared seafood); a variety of 12 small plates (like rock shrimp tempura and rich Japanese mentaiko pasta with clams, Kurobuta pork, Parmesan, lime, and spicy cured fish roe), anticuchos (skewers from the grill, including classic beef heart) and shareable dishes like lobster paella and grilled chicken (half or whole). The menu has more than enough to appeal to all kinds of diners. 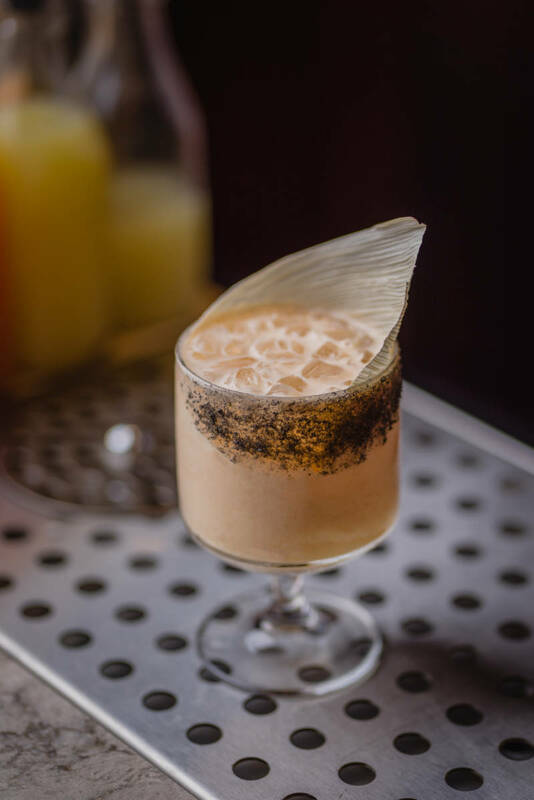 Owner John Park is a co-founder of Whitechapel and Novela, and has obviously focused on creating quite the bar program, with Peruvian pisco and Japanese whisky figuring prominently (and drinks have an anime theme, just in case you're wondering). The Ceres, Rayearth, and Windham aperitivo features a food-friendly combination of Martini bitter, Joto yuzu sake, and cava, and you’ll note some fun garnishes, like ground cherries on top of the Adventures in the Kanto Region cocktail. You’ll also find some excellent sakes curated by sake sommelier Stuart Morris, Japanese bottled beers, and wine and local beers on tap as well. The former Ottimista-Enoteca location was known for its welcoming patio, and KAIYŌ kept that fun feature intact. 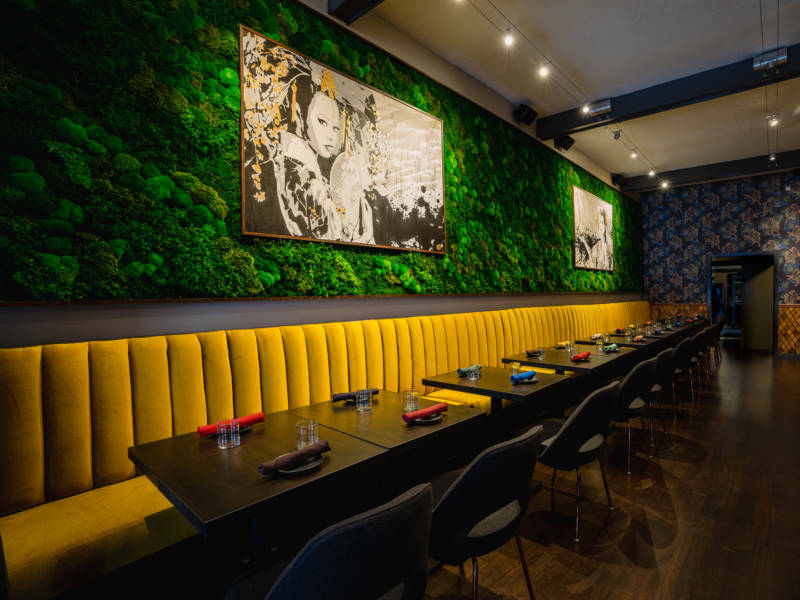 They added an eye-catching bar inside (the marble bar is lit by handmade, Parisian lanterns), a 35-foot-long, living moss wall that is a bright and verdant green, an eye-popping yellow banquette and street art paintings by artist Miss M and leopard wallpaper on the back wall. Hannah Collins collaborated with Park on the lively design. Whether you’re meeting a friend (or date) for a drink and bites, sitting for a full-on meal, or maybe just coming by for a nightcap, this playful new spot has all the makings of being a neighborhood hit. Oh, falafel. Here in the States, it can be terribly disappointing: dry, stale, undercooked, overcooked, left out all day, tasting of old oil…but when it’s good, it can be transcendent. In the Lower Haight, on the corner of Pierce and Scott is Palmyra, conveniently right on The Wiggle in case you want to park your bike and grab a meal. It opened in 2011, and the Syrian family who runs it is incredibly kind and will dote on you like you’re their best customer. And they will also serve you spectacular falafel. I have to apologize to the family in advance for sharing this tip with you, but the trick is to ask for the falafel to be freshly fried. Yup, you can wait. It makes all the difference. And don’t get a wrap, which has never really done anything for me here—it’s all about the falafel plate. For $9.50, you get five pieces of falafel, their smooth and rich hummus, tomato and cucumber salad, lightly warmed pita, white garlic sauce (I tend to eat every last drop), and hot sauce. The falafel are the size of Hostess Donettes (the mini doughnuts) and are as soft, fluffy, and delicately crumbly as one too. They have a dark brown exterior that is coated with nutty sesame seeds, and the falafel will come out piping hot (wait a couple minutes! ), providing a wonderful contrast against the cool hummus and garlic sauce. It’s funny to me that I dislike their hot sauce (I always crave one that is thicker and fierier, which is why I never order their wrap) and the pita isn’t the plush kind I prefer, but somehow, this dish is much greater than the sum of its parts. Add a cold EFES beer, and maybe have some of their housemade and sticky sweet kanafa for dessert. 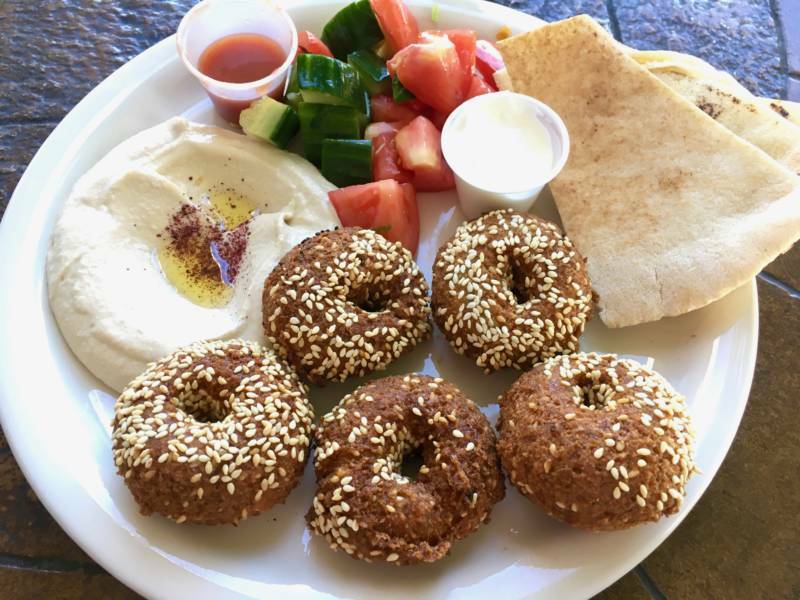 You can return for their rotisserie chicken (one of the city’s better deals) or their kibbeh (made with cracked bulgur wheat, ground beef, onion, and pine nuts), but the falafel plate will be calling you back soon enough. Get a group of friends together and make a lunch or dinner reservation at M.Y. 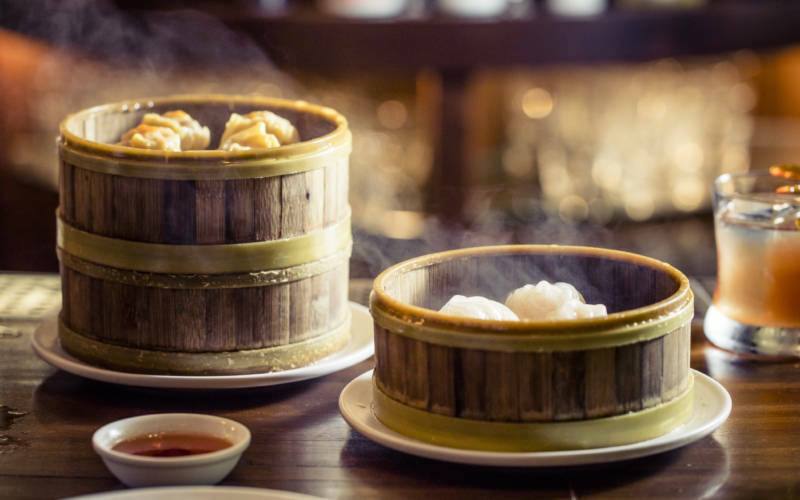 China (located Under the Dome in the Westfield San Francisco Centre), because in honor of National Dumpling Day on September 26—and all week long (September 24-30)—Martin Yan and executive chef Tony Wu are offering one heck of a mix-and-match dumpling special. Guests can order any combination of dumplings (pork: pork, cabbage; seafood: shrimp, scallop, spinach wrapper; or vegetarian: eggplant, mushroom, potato, turmeric wrapper) in the following quantities: choice of 10 for $12; 20 for $23; and 30 for $32 (you know which one to get). Get ready for dumpling action. All orders include chile oil, black vinegar, crushed peanuts, sesame paste, chopped green onion, and cilantro that you can sprinkle, add on top, dip, pour, and more. Go nuts. Feeling fancy? Add on the Crazy Rich Dumplings, three juicy dumplings made with steamed foie gras, pork, and shrimp for $20. Ready for another double cheeseburger? You’ll want to plan your next burger mission for a Sunday, which is when Comstock Saloon on the border of Chinatown, North Beach, and the Financial District is offering quite the Barbary Coast kind of special: order a Comstock double cheeseburger ($20) and get a free boot of Four Roses bourbon and a draught beer! It’s a new kind of Sunday best. 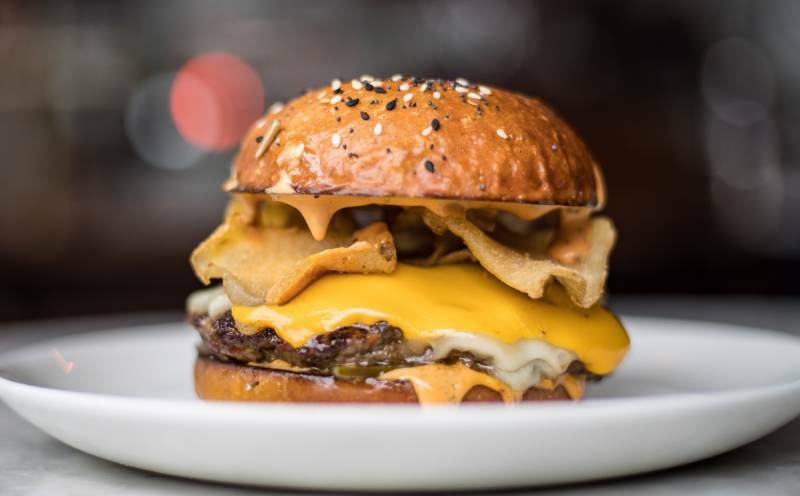 The burger is such a winner, with Fontina, American cheese, secret sauce (gotta have secret sauce! ), pickles, shallot, and here’s the kicker: malt vinegar chips! 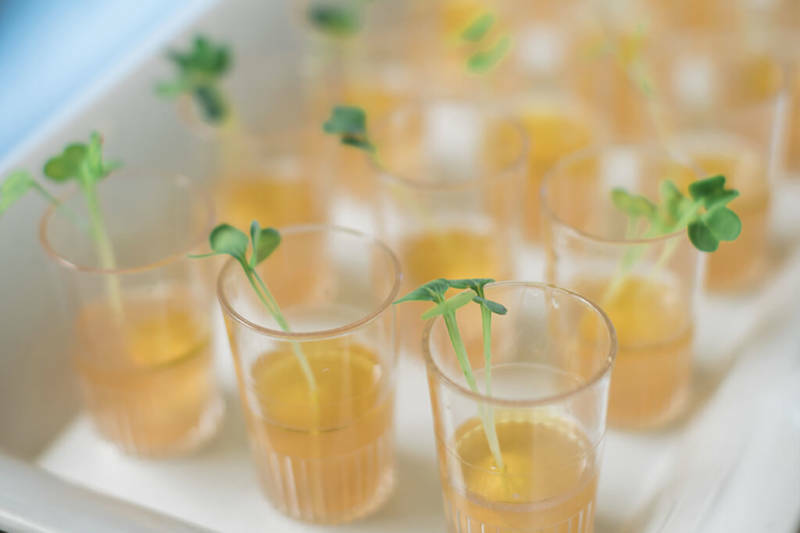 Actually, the glass boot of bourbon is the kicker, but at least you know it’s coming. This special offer is available every Sunday from 4:30pm–9pm, through 2018. Hop to it. Chamber music and food from top Bay Area chefs and wine? It will all be happening at the inaugural Musica Marin Festival, with classical music performances, from Brahms to Mendelssohn, staged in chapels, churches, and a stunning nine-acre private estate in Tiburon. Internationally acclaimed violist Ruth Kahn is behind the event, working with chef and festival Culinary Director Mark Furr, who is bringing on chef Tu David Phu (Daniel, Acquerello, Chez Panisse); Rachel Aronow (The Alembic, 3rd Cousin); Rogelio Garcia (Cyrus, French Laundry, Angele); Edward Martinez (pastry chef, Lazy Bear); and others, who will be providing food for receptions and parties. Add in fine wines and some beautiful North Bay backdrops, and it’s going to be a one-of-a-kind music festival that also has a mission. Musica Marin is a nonprofit organization dedicated to preserving musical culture for all ages through unique music programs and concert events that benefit young musicians throughout the San Francisco Bay Area.